Killer Characters: Did you lose an hour? I lost a garden. Did you lose an hour? I lost a garden. For most of the country daylight savings time hit last night and we all lost an hour. Let me tell you, it came at a most inconvenient time. Lord love me, I don't have an hour to lose right now. Odd things are happening at the White House. At first I thought Milo, the Commander in Leash, was to blame for the damaged plants in the First Lady's Kitchen Garden. Something had ripped the plants clean out of the ground! I tried to save what I could and replanted what I couldn't save. But then not long after that, red chili peppers started growing where I'd planted green bell peppers and cabbage is popping up where the First Lady's favorite lettuce should be. And everyone is blaming me! 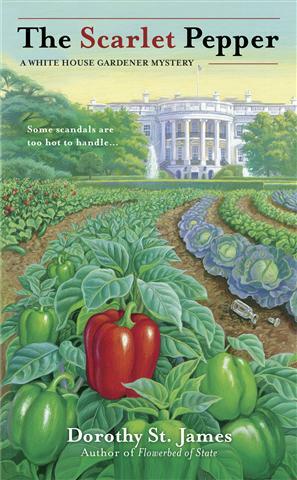 In less than a month's time, you'll be able to read all about my misadventures in the vegetable garden when THE SCARLET PEPPER goes on sale April 3, 2012. I hope by that time to have caught my garden thief (and to have recovered from this dratted lost hour of sleep)! How are you coping with the time change? 1. Get in on the drawing to win one of 4 copies of THE SCARLET PEPPER this week from Books On The House! Contest winners will be announced on MARCH 14, 2012! 2. Head over to Goodreads for a chance to win one of 2 copies of THE SCARLET PEPPER! Contest winners will be announced on APRIL 5, 2012! 3. Go play the fun and games over at The Romance Reviews for a chance to win tons of prizes including a copy of the book that started it all, FLOWERBED OF STATE! The contest is running for several weeks, but Flowerbed of State is being given away at the end of the week of MARCH 14 and ending MARCH 21, the prize winners will be announce MARCH 22! Planted my small garden last year and was thrilled with my first watermelon. Came home to find the vine stretched to the limit and the fruit scooped out to the rind. The tomatoes and marigolds were gone too. The culprit(s): squirrels, racoons, deers, or foxes? Which do you think. Something more nefarious? If I were you, I'd keep a close eye on your neighbors. There's something fishy going on in your garden. Take it from me, you can't be too careful! I'm looking forward to reading this book and getting to know you, and Milo! It sounds great and the cover is a knockout! I think I already entered all three of the giveaways you mentioned. Good luck! I hope you win one of the contests, Nancy! And thank you! Berkley Prime Crime did give me a great cover, didn't they? Now, I just need to get a handle on Milo. He's been full of puppy energy lately! I felt like I got up early this morning, but it was late. Unsettling! LOL! I woke up early, but after walking the pups and my morning weeding I headed back to bed. Liz, I always blame the racoons. Perhaps its their bandit masks, but I don't trust them! Where I live now, it's the rats that get my plants. Yuck! I did, however, have good luck with my first ever planting of watermelons last summer. Planted too late, though, and were eating watermelons around Thanksgiving time. But the rats ate every single tomato. The verrry large, black snake population (3 in my laundry room, once upon a time) and hawks seem to keep rodents at bay. This, at least, is the story my nephews are telling me, among offers to capture various animals for their children. I had a relative (no names) who didn't like eggplant and once accidentally removed a gorgeous one from the garden. Are you quite sure the President or one of his henchmen aren't swapping veggies they like for ones they don't like? Sound like you've got your hands full, Casey. Maybe the lost hour will do in your prankster. I plan to nap this afternoon. Great cover! And I'm looking forward to the new book--Flowerbed of State was a lot of fun. I'm garden-challenged, and I blame it on a too-shady yard. But I'm planting two apple trees today!